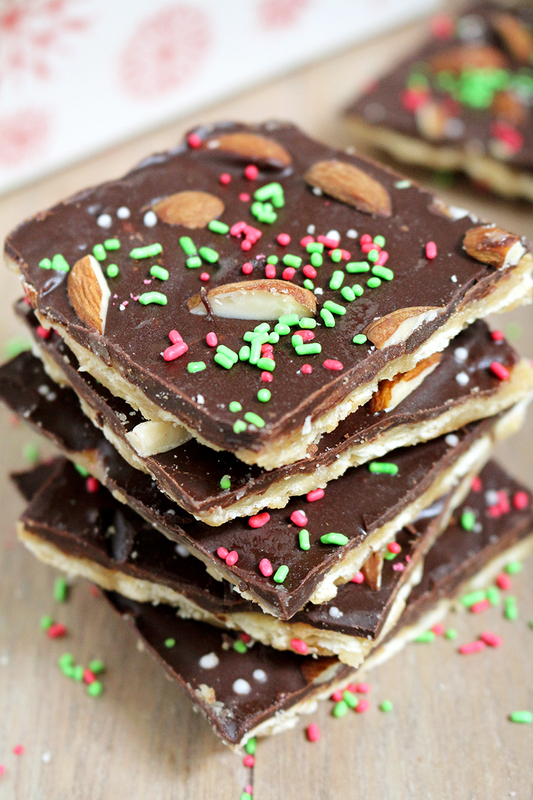 Easy Christmas Crack Saltine Toffee is a perfect crunchy Christmas treat. It‘s a last minute dessert for all those who don‘t have enough time for preparing holiday desserts. Looking for a quick, simple, yet delicious Christmas treat? 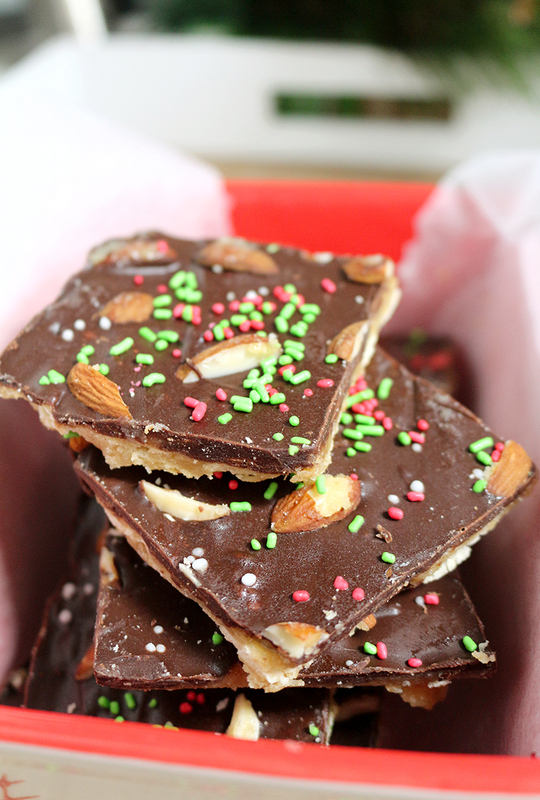 I have just what you need – Easy Christmas Cracks Saltine Toffee. 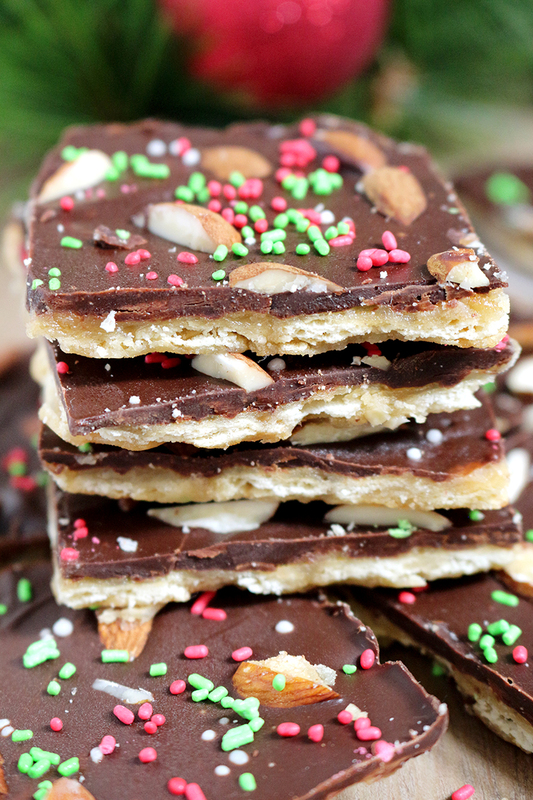 It takes only 15 min to make these crunchy Christmas Saltine Toffees. OMG Christmas is sooo near… Are you ready? My family and can´t wait for the holidays to come. My son is looking forward to getting his presents under the Christmas tree, my husband, just can´t wait for the holidays to spend more time with the family, and I love decorating our home and preparing Christmas treats. 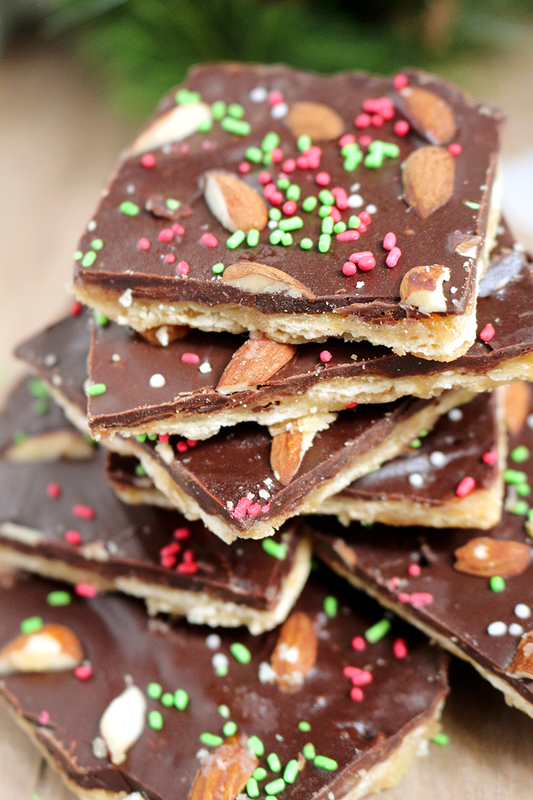 If you are looking for the last minute recipe, Easy Christmas Crack Saltine Toffee is just what you need. It is even better to be ready on time, so make them earlier, leave in a well sealed container, and then they will be even more delicious. 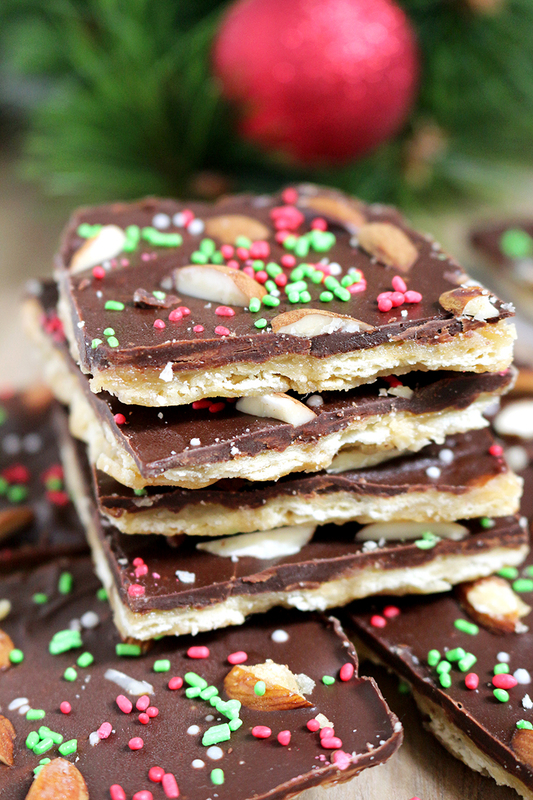 8 ingredients + 15 min of your time = Easy Christmas Crack Saltine Toffees. I love this recipe. Instead of almonds, walnuts, pecans or hazelnuts can be used. Use M&M candies in the holiday colors or just sprinkle them. Instead of semi sweet chocolate chips, white chocolate can be used, or a combination of the two. I used light brown sugar, because of its mild taste, but dark brown sugar can be used, as well. Both the color and the taste will be stronger. There are many options, choose the one that is right for you. 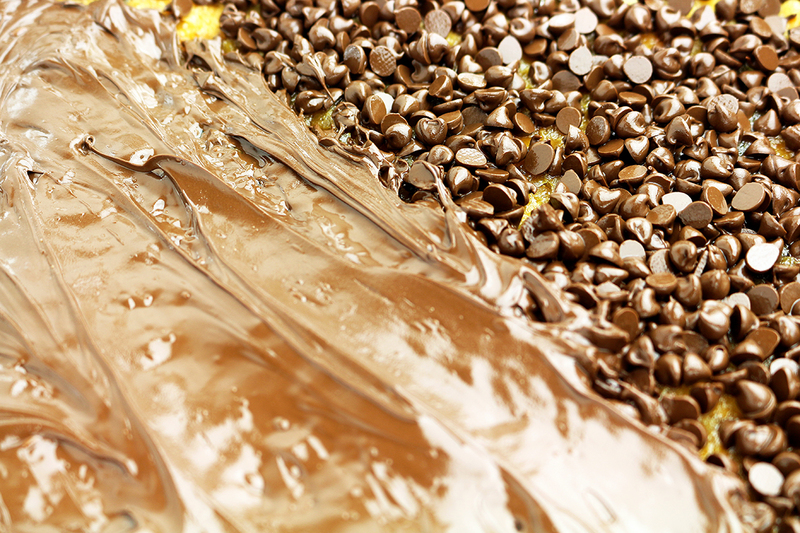 Saltines and almonds are crunchy, while chocolate melts. I love this combination. As you already know, I enjoy preparing and decorating cookies. My sweet Christmas plate is ready. To make your own, I suggest these cookies. For sugar cookie fans I have Christmas Sugar Cookies with Cream Cheese Frosting. For those who prefer Red Velvet cookies – Holiday Red Velvet Kiss Cookies. If you like Shortbread cookies Holiday Maraschino Cherry Shortbread Cookies are perfect. Chocolate fans will love Christmas Chocolate Crinkle Cookies. Our most popular post on the blog is perfect for cheese cookie fans – Chocolate Chip Cheesecake Cookies. Everything is a huge pleasure for me these days – preparing Christmas treats, decorating our home and Christmas tree, preparing Christmas presents… I wish you all Merry Christmas! Preheat the oven to 350F. Line a 9x13 inch baking pan with an aluminum foil and spray with non stick spray. Place one layer of saltines on the bottom of the baking pan. Set aside. Melt butter in a medium dish, using medium heat. Add brown sugar, stirring until it melts completely. Add vanilla and milk and stir well. Leave to boil for 3-4 minutes, without stirring. Remove from heat and pour over the saltines, spreading evenly over the crackers. Bake for about 6-7 minutes or until bubbles appear. 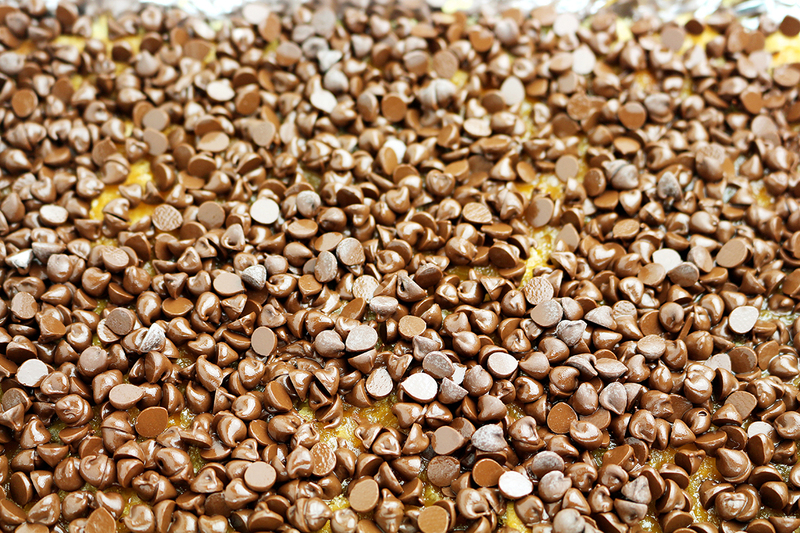 Take out of the oven and sprinkle with semi sweet chocolate chips. Leave for 5 minutes for chocolate chips to soften, then spread evenly, using spatula, so to get a layer of melted chocolate. Sprinkle with almonds and sprinkles. Leave it to cool at the room temperature, and then transfer to the fridge until it becomes solid - 4 hours minimum, possibly overnight.